These funky rubber pendants are a brilliant gift idea for girls on the go! Durable and fun, each piece features a colourful Christian symbol with an encouraging Bible verse written on the back. Includes an adjustable lace cord, approximately 60cm. 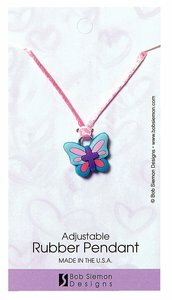 About "Rubber Pendant: Butterfly 2 Corinthians 5:17 Adjustable Lace Cord"